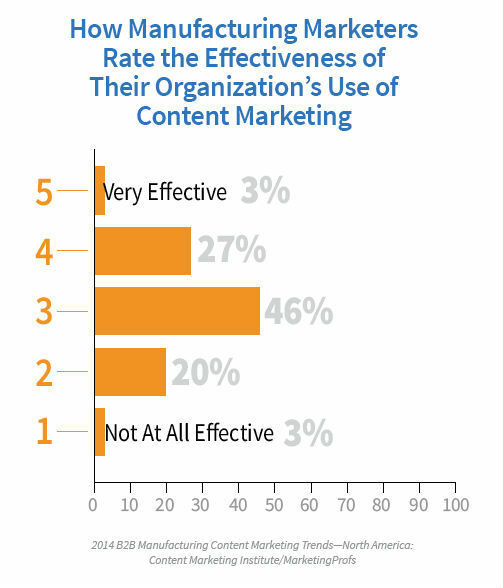 When compared with their B2B peers overall (of whom, 42 percent say they are effective), manufacturing marketers lack confidence in their content marketing effectiveness. This could be due to the fact that they are newer to content marketing, or because they don’t have a documented content marketing strategy in place, or both — or even to some other combination of factors. What is certain, however, is that other CMI research has found a clear link between a documented strategy and overall effectiveness, and only 21 percent of manufacturing marketers have one (compared with 44 percent of B2B marketers overall). Manufacturing marketers use many of the same tactics as their overall B2B peers, and even use the same average number of tactics (13). They do, however, use print magazines (69 percent vs. 35 percent) and print newsletters (35 percent vs. 22 percent) at higher rates when compared with other B2B marketers. They also use eNewsletters (82 percent vs. 80 percent), in-person events (81 percent vs. 76 percent), and videos (80 percent vs. 73 percent) more frequently. Of all the tactics they use, they rate in-person events and videos as most effective (click to tweet). 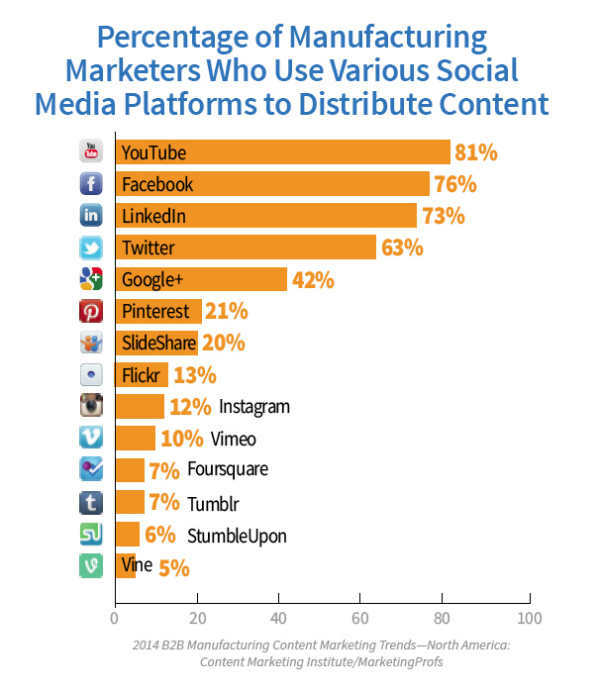 Eighty-one percent of manufacturing marketers use YouTube to distribute content, and they also rate it as the most effective social media platform they use (click to tweet). While many manufacturers use video to demonstrate products, video storytelling is on the rise in this sector (see an example here). 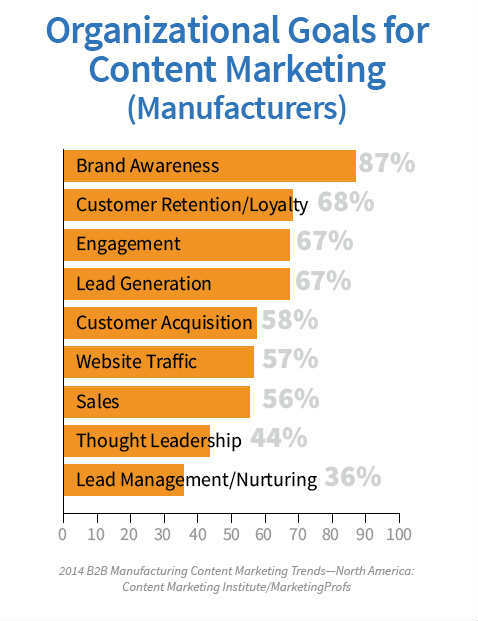 While all B2B marketers say brand awareness is their top goal, manufacturing marketers place more emphasis on customer retention and loyalty (68 percent vs. 57 percent) and less on lead generation (67 percent vs. 74 percent). The biggest difference, however, is that manufacturing marketers seem far less concerned with thought leadership (44 percent vs. 68 percent) (click to tweet). 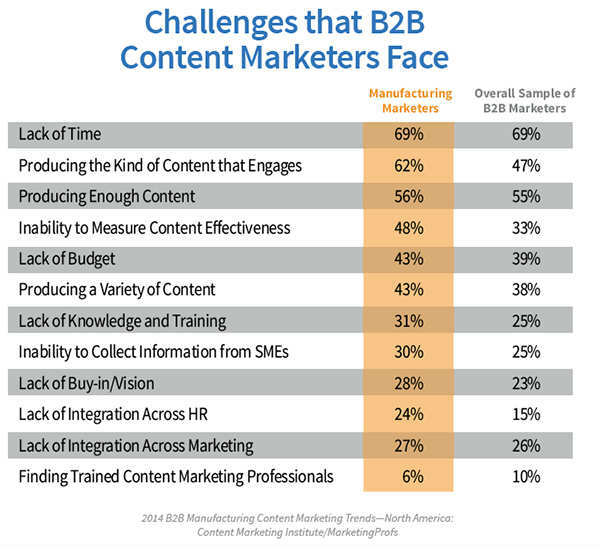 Manufacturing marketers are markedly more challenged than other B2B marketers with producing the kind of content that engages (62 percent vs. 47 percent) and with the inability to measure content effectiveness (48 percent vs. 33 percent) (click to tweet). 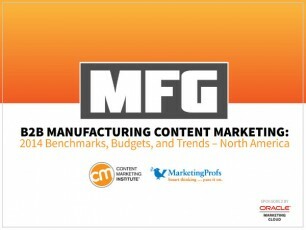 What percentage of budget do manufacturing marketers allocate to content marketing? What metrics do they use to gauge success? How much content creation do they outsource? 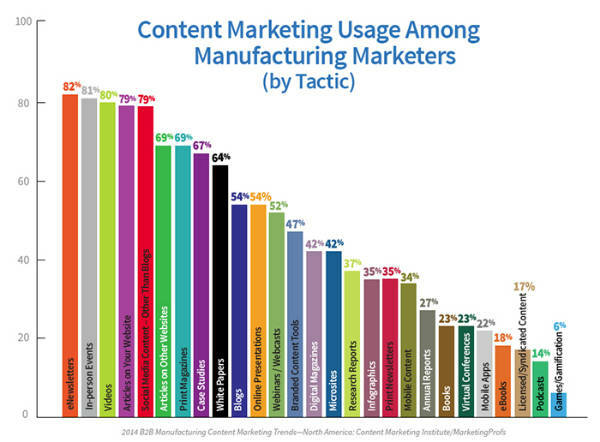 In CMI’s discussions with manufacturing organizations that are getting started with content marketing, we are seeing success in small “pilot” programs. These tend to last at least 6 months, with agreed-upon objectives that, at the very least, are getting different silos within the organization talking about what marketing objectives can be accomplished with consistent content creation and distribution. Do you think that manufacturing marketers are “laggards”? Why or why not? Are you just getting started with a program? What are your challenges? Or do you already have some successes to share? Let us know in the comments!